The short version: Dragon Age: Inquisition was hampered by a host of problems, including the challenges of shipping on five platforms at once (PC, PS4, PS3, Xbox One, and Xbox 360), the addition of a multiplayer mode to Dragon Age for the first time, and the technical difficulties of Frostbite. Too many people were assigned to work on the game when it first started development, forcing the leadership team to spread themselves thin and make fast, questionable decisions in the interest of ensuring that everyone had work to do (work that they’d frequently have to redo later). Most notably, Inquisition was the product of the “BioWare magic” documented in our Anthem investigation. Much of the design and story was finalized during the final year of development, leading to stress and crunch throughout 2014 as the Inquisition team scrambled to finish the game. Once Andromeda shipped in March 2017, it was back to Dragon Age for this team, even as some of them started to sense that Anthem was going to be the next project to turn into an all-hands-on-deck disaster. The Joplin team expanded with people who were rolling off Andromeda and kept working, prototyping, and designing the game. After spending months of their lives helping finish a Mass Effect that didn’t excite a ton of people, it was nice to return to Dragon Age. One thing that wasn’t discussed much on Joplin was multiplayer, according to a few people who worked on the project, which is perhaps why the project couldn’t last. While BioWare’s publisher and parent company, Electronic Arts, tends to give its studios a fair amount of autonomy, there are still mandates to follow. By 2017, EA had not been secret about its desire to make all of its major products into “games as a service,” best defined as games that can be played—and monetized—for months and years after their release. Traditional Dragon Age games did not fit into that category. Inquisition had a multiplayer mode, but was something like that really going to bring in the long-term revenue that EA wanted from expensive productions like Dragon Age 4? By the latter half of 2017, Anthem was in real trouble, and there was concern that it might never be finished unless the studio did something drastic. In October of 2017, not long after veteran Mass Effect director Casey Hudson returned to the studio to take over as general manager, EA and BioWare took that drastic action, canceling Joplin and moving the bulk of its staff, including executive producer Mark Darrah, onto Anthem. When asked, a few BioWare developers agreed that it’d be technically possible for a game built on Anthem’s codebase to also have an offline branch, but it’s not yet clear whether Morrison will take that approach. If it does turn out to be an online game, which seems likely, it would be shocking if you couldn’t play the bulk of it by yourself. (Diablo III, for example, is online-only on PC yet can be played entirely solo.) One person close to the game told me this week that Morrison’s critical path, or main story, would be designed for single-player and that goal of the multiplayer elements would be to keep people engaged so that they would actually stick with post-launch content. Single-player downloadable content like Dragon Age: Inquisition’s Trespasser, while often excellent, typically sells only a fraction of the main game, according to developers from BioWare and elsewhere across the industry. Yet this wouldn’t be a “live service” game if it was a repeat of Dragon Age: Inquisition, which compartmentalized its single- and multiplayer modes. 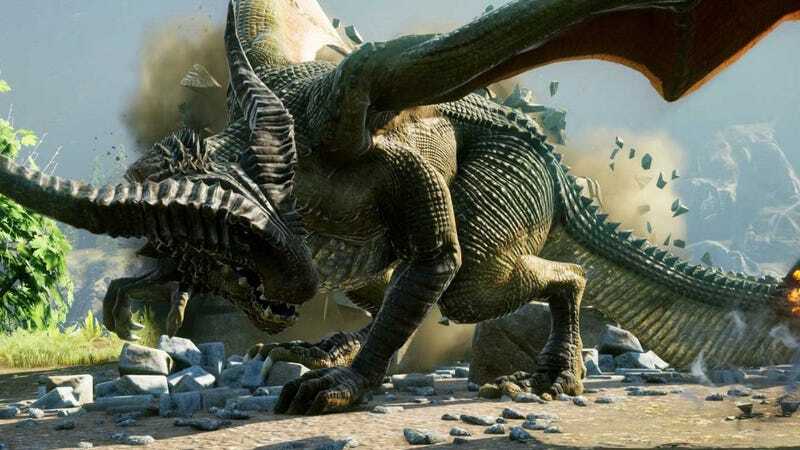 Fans in the past have grown outraged at the idea of BioWare putting a lot of emphasis on multiplayer gaming, but there are ways in which a service-heavy Dragon Age 4 could be ambitious and impressive. For example, some ideas I’ve heard floated for Morrison’s multiplayer include companions that can be controlled by multiple players via drop-in/drop-out co-op, similar to old-school BioWare RPGs like Baldur’s Gate, and quests that could change based not just on one player’s decisions, but on the choices of players across the globe.